University of Santo Tomas releases USTET Results AY 2014-2015 - Balita Boss! 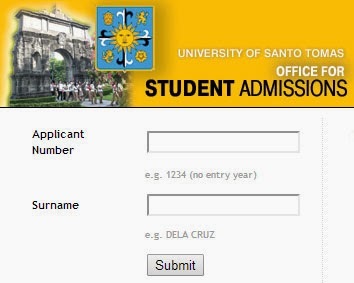 The University of Santo Tomas Entrance Test or USTET results for Academic Year 2014-2015 are released Tuesday, January 28. You can view the USTET passers online thru online inquiry on the official USTET website, http://myuste.ust.edu.ph:8888/admission/results.jsp. USTET 2014 was conducted on September 1, September 29 and December 1, 2013 at UST España, Manila. The test was administered by the Office for Admissions (OFAD). Aside from online availability of exam results, complete list of passers will be posted also in UST campus on January 29, 2014. In order to search the results page, enter the “Applicant Number” and your “Surname,” then click the Submit button. FAILURE TO APPEAR ON THE SAID DATES WILL MEN FORFEITURE OF THE CHANCE FOR ADMISSION. ADMISSION IS ON A FIRST COME FIRST SERVE BASIS FOR GUARATEED SLOTS ONLY. APPLICANTS WHO FAIL TO GRADUATE AT THE END OF SY 2013-2014 WILL NOT BE ACCEPTED. PLEASE VISIT THE OFFICE FOR ADMISSION (OFAD) ON MARCH 08, 2014 FOR FURTHER INSTRUCTIONS. YOU MAY ALSO VISIT OUR WEBSITE (OFAD.UST.EDU.PH) ON MARCH 08, 2014 FOR FURTHER INSTRUCTIONS. IF INTERESTED, YOU ARE ALSO QUALIFED FOR ADMMSION TO COLEGIO DE SAN JUAN DE LETRAN-MANILA AND ANGELICUM COLLEGE IN QUEZON CITY. ON SITE: PLEASE VISIT THE OFFICE FOR ADMISSIONS (OFAD) FROM MONDAYS TO SATURDAYS (EXCEPT HOLIDAYS) FROM 8:30AM-11:30AM AND 1:30PM-4:30PM. (ONLY FOR QUALIFIED APPLICANTS WITH TRAVEL MANAGEMENT, HRM OR NURSING AS THEIR FIRST CHOICE. PLEASE RESERVE YOUR SLOT AT THE OFFICE FOR ADMISSIONS [OFAD] ONLY). THE RESERVATION FEE (PHP5, 000.00) SHALL BE DEDUCTED FROM YOUR TUITION FEE UPON ENROLMENT. IF YOU RESERVE A SLOT IN ONE PROGRAM, YOU FORFEIT YOUR SLOT IN THE OTHER PROGRAM. FAILURE TO RESERVE A SLOT WITHIN THE SPECIFIED SCHEDULE WILL AUTOMATICALLY MEAN FORFEITURE OF YOUR SLOT. YOU ARE ALSO QUALIFIED FOR ADMISSION TO COLEGIO DE SAN JUAN DE LETRAN-MANILA AND ANGELICUM COLLEGE-QUEZON CITY. APPLICANT HAS MET THE REQUIRED CUT-OFF SCORES OF THE PROGRAM OF HIS/HER CHOICE. APPLICANT IS QUALIFIED FOR INTERVIEW AS AN ADDITIONAL REQUIREMENT FOR THE PROGRAM OF HIS/HER CHOICE. ALTHOUGH APPLICANT MET THE REQUIRED CUT-OFF SCORES OF THE PROGRAM OF HIS/HER CHOICE, BECAUSE OF QUOTA LIMITATIONS, HE/SHE SHALL HAVE TO WAIT FOR FURTHER INSTRUCTIONS. HE/SHE CAN ONLY BE CONSIDERED IF SLOTS ARE STILL AVAILABLE. APPLICANT DID NOT MEET THE REQUIRED CUT-OFF SCORES OF THE PROGRAM OF HIS/HER CHOICE. IS THE AVERAGE OF THE APPLICANT'S RATINGS IN ENGLISH, MATH AND SCIENCE. IS BASED ON THE OVERALL PERFORMANCE OF THE APPLICANT (MENTAL ABILITY, ACHIEVEMENT AND HIGH SCHOOL GRADES). SEPARATE RANKING WAS DONE FOR FIRST AND SECOND CHOICE APPLICANTS.